After the first World Cleanup, in which 157 countries and almost 18 million people took part, a special conference was held in Tallinn in January, where Latvia was granted an award for outstanding achievements as the country with the highest steady annual growth in the number of participants. This is a serious international assessment of the tremendous work that has been done in the previous ten years by all the participants who stubbornly and gladly put things in order in their own environment. Sincere thanks to all who ever took part in cleaning and improving the environment in Latvia, in all parishes, cities, settlements, schools, as well as all of our people in the world who, with a love of nature and culture, conducted voluntary cleanup in many places on different continents and in different countries! 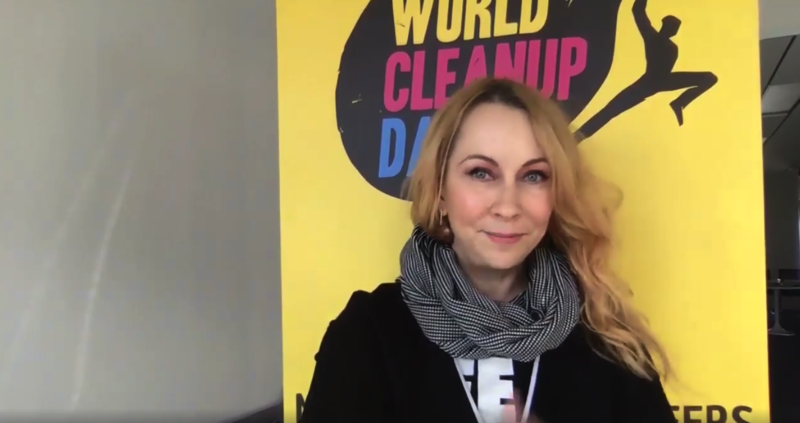 We received greetings from Heidi Solba, coordinator of the World Cleanup member countries, to all cleanup coordinators who work in the districts who help local communities to organize cleaning from year to year, and who met on March 26 of this year at the 11th Big Cleanup Preparing Conference! Heidi also sincerely greeted the entire “Latvian team”, each participant with “The Best sustained percentage of population” award. All participants can really be proud of their work, noticed and appreciated far beyond the borders of Latvia, and who also become a source of inspiration for people all over the world! See you at the Big Cleanup on April 27 and on the Second World Cleanup on September 21! LET’S GET RID FROM WORN-OUT TIRES TOO! Experience and statistics of the Big Cleanup show that car tires are one of the most common waste in nature. Therefore, together with the Latvian Green Fund, we invite you to clear Latvia from mountains of worn tires! ✅ During the whole month – the active season of changing tires – from March 28 to April 30, you have an opportunity to leave used tires free of charge in specific tire replacement services. ✅ Within two weeks – from April 15 to April 30, each individual can leave four worn tires free of charge at specific collection sites for sorted waste. ✅ On April 27, in the framework of the Big Cleanup, individuals will be able to leave four worn-out tires free of charge at specific collection sites for sorted waste, or to take part in the cleanup campaign as part of the Big Cleanup, collecting illegally discarded tires polluting the environment. The future begins today – almost everyone knows this phrase, but how do we really understand its meaning? Who is Greta? Greta Thunberg is a Swedish girl who, at the age of 15, started her own single strike in front of the parliament building with a self-made poster “Schoolchildren Against Climate Change” – (moreover, I would like to add that Sweden really is one of those countries where sustainable development moves in the right direction). She stood there alone, but not for long – the Swedish girl was tired of the many rather useless speeches that global environmental problems are in fact solved by future generations. She, like her generation, does not want to receive such a “gift.” No one would want that. We and our offspring will face a global environmental crisis, this is clear. However, in an interesting way, the human mind is designed so that we leave everything that is unpleasant in a remote corner of the brain with an extremely heartfelt wish that someone else will ever deal with it. But Greta says – nothing like that. We want decision makers to act “as if their house is in flames,” so that changes take place immediately. Today, March 15, schoolchildren’s strikes take place all over the world – in 112 countries and 1,769 locations, including Latvia. The strikes themselves, of course, will not lead to any direct changes and may eventually turn into another show that will soon be used by various stakeholders. However, I hope that many will wonder what kind of signals young people are sending and realize that youngsters want to live in a clean, beautiful, healthy environment. And that we all really want this. Maybe not enough? I think I know the answer – to inspire each other, to attract each other, to create a new philosophy of life, which may differ from the current one, and, in the end, to save oneself from fears. In Latvia, in my opinion, the best “strike”, confirmation of the real concern for environmental protection and love for nature are voluntary cleanups and the Big Cleanup. But I am for schoolchildren’s strikes. Especially for the schoolchildren’s, since this is the generation that must be very brave, very talented, endowed with very good health, and become those who can withstand the dogmas and habits of their ancestors. This will be a unique generation. During the Big Cleanup, all of us who have been participating in it for 10 years in a row clean up and care for our Latvia. We have become an example for almost 158 countries in which the World Cleanup is currently taking place. This may not seem like a big deal, but this is a great start, as well as schoolchildren’s strikes are the beginning of something bigger. This is unity. This is true love, true patriotism and true wisdom of life. I am proud that we – almost 500,000 participants of the Big Cleanup – are who we are. The first year of the next decade of the Big Cleanup begins. We start it with new ideas, with a new challenge – to prove to the world … No, let’s not prove anything, just show how a country in Northern Europe, near the Baltic Sea can become an example for the whole world, an example that nature should be treated with great respect and love. Since nature is ourselves, nature is our true temple, and our mutual symbiosis is so obvious that only the blind in heart can say the opposite. Leonardo da Vinci, back in the distant 16th century, put forward ideas about this inextricable umbilical cord connection, which were subsequently summarized in his book “The Theory of Water”: Earth is a functioning organism, and water for the earth means the same thing as blood for a human body. It flows from the mountains to the sea, and then, as Leonardo says, returns to the mountains through the depths of the earth, and this is the same circulatory system that we find in humans. Nowadays, humanity needs such a genius as Leonardo was. Can he/she be born in Latvia? I really hope so. Let’s go to nature, breathe in nature, save it and make it divinely beautiful again.